There are two types to consider – vented or condenser. Vented Dryers require a hose to vent the warm moist air from the drying process. This type of dryer requires little maintenance apart from the one filter that needs cleaned after each use. Condenser dryers remove the need for a vent and can be placed anywhere in the house. However a condenser dryer needs more maintenance. They have two filters which need to be cleaned regularly to keep the appliance working efficiently. This type of dryer has a built-in container which collects the condensed moisture extracted from the clothing and this needs to be emptied after at least three cycles. Sensor Dryers are available on both vented and condenser dryers. The big advantage to them is the built-in sensor which automatically switches the programme off once the clothes are dry – removing the guess work of setting a drying time. Washer dryers handily combine a washing machine with a tumble dryer. Washer dryers are a great solution for people with limited space. They condense their own steam eradicating the need for a vent. They don’t need to be maintained by the user like cleaning the filter because all the fluff is pumped out with the steam using the water from the washer and the outlet pipe. 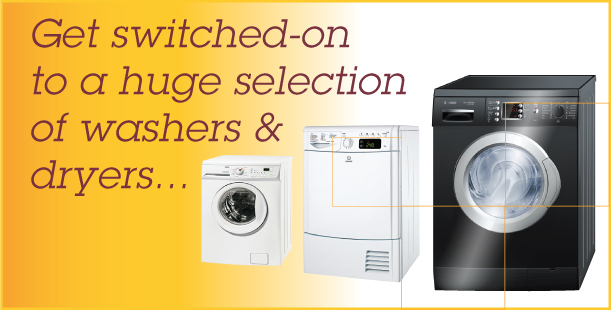 If you’d like more advice on selecting Washers or Dryers why not call us or visit our Showroom, we’re always happy to help! © 2019 Northern Vacuums. Theme by XtremelySocial.